Yeah, you gotta hear the story about the name for this one. 400 Pound Monkey, a product of Left Hand Brewing, based in Longmont, Colorado, is an India Pale Ale striving to be different from the eighty-kabillion other IPA’s released in the last decade. Under the guise that beer lover palates have been destroyed by ultra-bitter, top-hop-heavy brews, this IPA is brewed English style and the goal is balance instead of a high score on the International Bitterness Unit (IBU) scale. If I were one to read between the lines, which I am… I would say that Left Hand is calling brewers who use massive amounts of hops as a marketing tool wasteful monkeys! On January 16, I prepared my tongue for a 12 oz monkey assault. The pour produced a small but long lasting head that was rocky in texture. The beer was a goldish-orange color and contained no sediment with a somewhat cloudy but mostly clear body. Lacing throughout the drink was above average; the glass I used will need a thorough sponging to get it clean. The aromatics are where 400 Pound Monkey starts to fall apart. At first nose, there is a slight hint of orange and pepper, which transitions into a deep toasted biscuit and bready aroma. Some caramel is present, but there is also some wet dog. A lot of wet dog. It’s off-putting and quite honestly almost reeks; thankfully as the beverage warms some, that seems to fade. I also got an aroma of pizza, which I cannot explain and found it to be neither negative or positive. I do think the pizza scent added a ton of acidity to the aroma (the acid was not present in taste). On the palate, the toasted bread flavor is prominent mixed with a dash of alcohol, which produces a warming effect on the tongue. This beer is quite herbal, which isn’t present in aroma, and has a minty tinge to it before finishing classically IPA, bitter. The finish is of average length and the flavors are quite pleasant although on the extreme edge of tolerability — if this got anymore toasty it would cross that line into burnt. I noticed a strange extreme bitterness on my lips as I drink this beer, similar to that of licking an envelope. While it didn’t change the flavor of the beer, it was something I haven’t experienced with other, more traditional IPAs. 400 Pound Monkey is definitely a different kind of IPA, but in my opinion, that doesn’t make it rate any higher. I awarded 14 points for its appearance, which is almost a perfect score. The beer’s color is very inviting to the eye and the lacing was award-worthy. 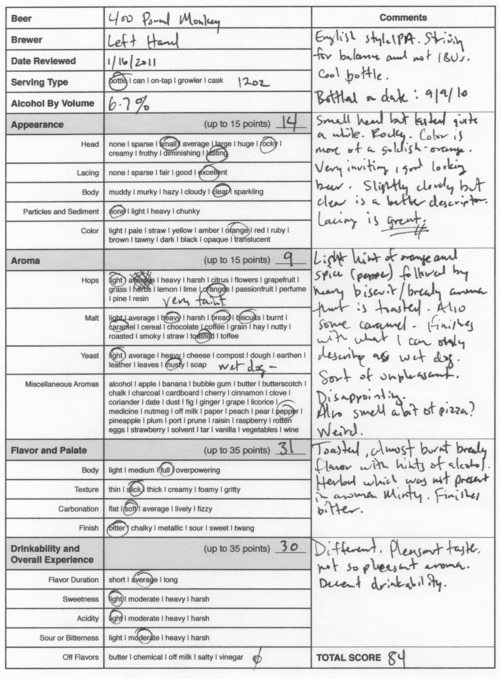 The aromatics suffered, only mustering up 9 points, and I gave 31 points for palate. Left Hand maxed everything out with this concoction, pushing the flavors to their limit. Overall drinkability gets 30 points: 400 Pound Monkey has a pleasant and even satisfying taste but a not so pleasing aroma. This beer walks a fine line with flavors that are almost too much and a smell that is nearly over the bounds of acceptability. Left Hand 400 Pound Monkey, 84 points. Price: $3.49 US for one bottle. Did you know Left Hand brews with clean energy? As stated on the bottle, it’s provided by SimpleSolar — and speaking of the bottle, this is one cool bottle if you like monkeys.